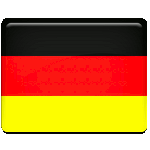 The Day of German Unity (Tag der Deutschen Einheit), also referred to as German Unity Day, is Germany's national day. It is celebrated on October 3, commemorating the anniversary of German reunification in 1990. A single German state first emerged in 1871, when the German Empire was founded. Otto von Bismark made a significant contribution to the country's first unification. In 1919, the Weimar Republic took its place. In 1933, the Nazis took power and started World War II in 1939. After the defeat of Nazi Germany in the Second World War, the country was divided into two parts in 1949. West Germany (Federal Republic of Germany, FRG) was occupied by the Allied powers while East Germany (German Democratic Republic, GDR) was occupied by the Soviet Union. In 1961, Berlin was also split into two parts by the Berlin Wall. The Berlin Wall fell on November 9, 1989, marking the end of the East German regime. The resolution seeking the accession of the GDR to the FRG came into effect on October 3, 1990. The anniversary of this event is now celebrated as the Day of German Unity. It was declared the national day of Germany. Every year, a new host town is chosen for the celebrations. Typically, the events are hosted in the state capital of the German state (Land) that presides over the Bundesrat (Federal Council) in the respective year. In addition, additional festivities are held in Berlin, state capitals and other cites.